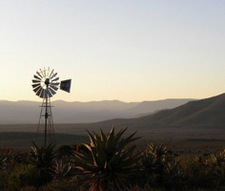 The Plains of the Camdeboo Private Nature Reserve is situated in the Great Karoo region in the south-east interior of South Africa, north of the town of Pearston in the Eastern Cape Province. It covers 8,827 hectares, and was formed in 2009 through the consolidation of 12 separate farm portions including parts of three of the original farms in the area, namely Rustenburg, Donker Hoek and Onverwagt. The primary aim of the reserve is to conserve, and where necessary, restore the natural landscape and its constituent habitats, species, ecological process and cultural heritage. The land is being restored through indigenous planting and prevention of soil erosion, and indigenous animal species have already been reintroduced to the area. Wilderness Foundation Africa is managing this process on behalf of the Mai-Family Foundation which owns the land. 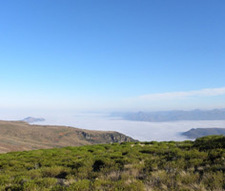 The reserve is included in the proposed Mountain Zebra Camdeboo Corridor (awaiting protected environment proclaimation). 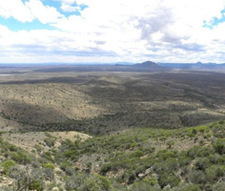 The corridor project is made up of numerous stewardship agreements of private land-owners between Mountain Zebra National Park and Camdeboo National Park.